This is a fantastic project to recycle and upcycle your old CDs, brown paper card and wallpaper sample books all in one go! By reducing what we use, reusing what we do need, upcycling, and recycling something once we have no more use for it, we can all make a small difference to the health of our planet Earth. 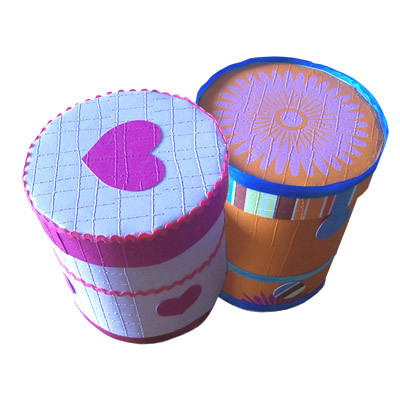 Follow our easy step by step instructions and see how easy it is to make your own recycled paper hatbox! 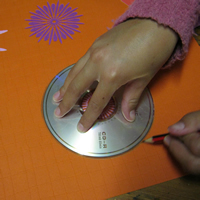 Take your CD, place it onto the chosen wallpaper (the thicker the better) and trace around the CD with your pencil. This marked out section will form the surface of your Hat box lid. TIP: Place the CD over a section of wall paper that you really like. This could be an area of design or wording that you like. 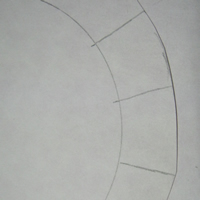 Now you want to create another circle around the first, about 2.5cm out from the inner circle. 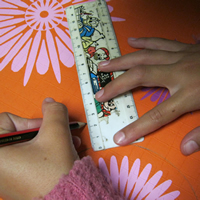 Measure at regular intervals with your ruler, 2.5cm away from the first circle, working your way around the circle. 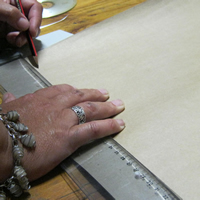 Then you can use free hand to connect the measurements, forming a larger circle around the first. Draw rough lines with your pencil, between the first and larger circle, as illustrated here. Cut out the circle along the larger circle line. Now cut the joining lines, between the first circle and larger one. 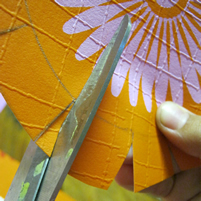 You want to use the tip of your scissors to cut small wedges out of the paper. Work your way around the larger circle, cutting small wedges from it, they end with their point touching the smaller (first) circle. 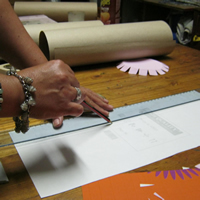 Measure using your ruler and pencil, a strip of Brown Craft Paper/Card approximately 5cm in width and approximately 50cm in length. We have used the brown paper that you find inside rolls or wrapping paper that you would normally recycle. Use your scissors to cut this out. 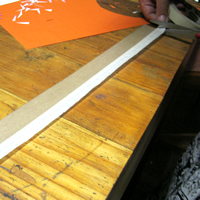 Apply the masking tape along one side of this recycled brown card. Ensure that the tape is stuck to the card, half on, half off. You really only want to have the a small margin of tape on the card, with the majority free. 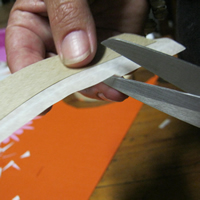 You want to repeat Step 4, cutting wedges out of the masking tape. Do it so that the point of each wedge meets the brown card only. 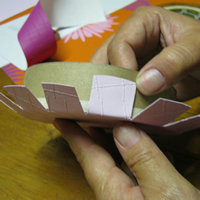 Take your CD and slowly roll it along the length of your recycled card so that the CD edge sits just on the outer edge of the card and right on the masking tape. 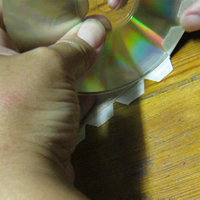 As you roll, lift each section of masking tape and stick it to the CD. Coming back to our finished cut outs from Step 5, we are going to stick this and the CD items together. 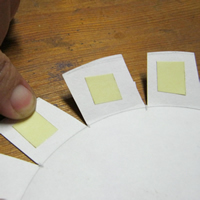 You will want to stick a small square of double sided tape to each flap of this circle. As you go, gently bend each wallpaper flap towards the centre. Now place your CD item squarely on top of this circle and lift each flap as you go, sticking it to the CD. You can finish the item off with a width of ribbon. Stick this to the width of your CD top, using double sided tape. Your hatbox lid is, in essence, complete. 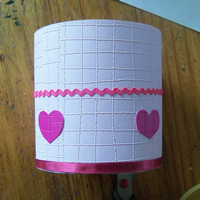 You can stick any embellishments that you like to the lid if you feel it needs more decoration. Now we need to create the actual hatbox, you will start by measuring out a width of approximately 50cm and a length you desire. Do this on both the recycled card and the wallpaper you have chosen. TIP: to get the exact width measurement, you can measure the circumference of your CD with a piece of string and then measure the length of string. Keep in mind that you will have to add 1cm or two to the final measurement, for the double sided tape, when overlapping to stick the sides together. The trickiest part comes now, when you need to make sure that your lid is larger than your actual box! 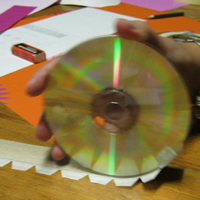 You want to repeat Step 1 on recycled cardboard: Create a circle, using your CD. 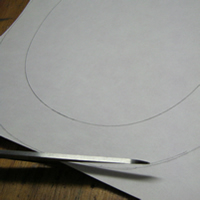 When you cut this circle out though, cut it just slightly smaller than the pencil line. Take this cut out and use it as the trace onto your decorated wallpaper. Cut out another circle from your wallpaper. You should have two circles, one in recycled card and another in wallpaper. 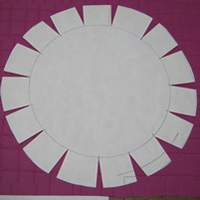 Now, taking your recycled card length from Step 12 and your card circle from Step 13, repeat Steps 8 & 9 (without the CD), using the masking tape to stick the circle to the card, as you roll it along the edge. You will have now formed the base for your box.  You will now cover the recycled card with your wallpaper. 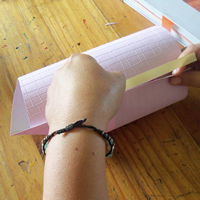 Roll the wallpaper around the box and use double sided tape to secure it in place. Trim any excess paper off. Stick the wallpaper circle to the bottom of the box, to cover the card. Use your ribbon and or embellishments to cover any joining lines (such as the bottom circumference) and to decorate your box. You are done! 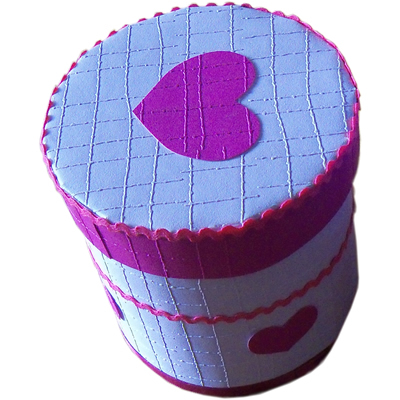 You now have one beautiful hat box – for storage or use it as a personalised gift box. 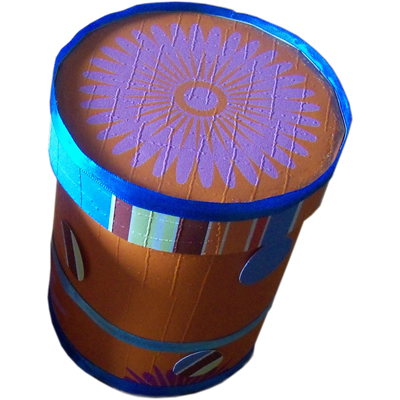 Now that you have successfully made one hatbox, now is the time to exercise your creativity and make another one, using as many upcycled materials as you can find!